With the ongoing political uprising and violent demonstrations in Kiev, my heart breaks for the people of Ukraine. I first visited Ukraine in 2005, but only spent a short time in the capital city of Kiev as my group's main purpose was meeting with Jewish students in Kharkov (Kharkiv) and the surrounding areas like Konotop and Sumy. I returned to Ukraine a year ago in February 2013 on an American Jewish Joint Distribution Committee (JDC)/United Jewish Communities (UJC) Rabbinic Cabinet Mission and spent much more time in Kiev, where I was able to feel the tension in the air. In Kiev, political protests calling for the downfall of Ukrainian president Viktor Yanukovych took a violent turn at the end of last month and dozens have died in the fighting. Yanukovych, ousted from power in the coup, has fled Kiev. The fact that Kiev has exploded in violence over the past month really wasn't surprising to me. In the almost 25 years since the breakup of the Soviet Union, Ukraine has never really felt completely independent. On both of my visits to Ukraine I heard members of the local Jewish community as well as professionals with the JDC ("The Joint") explain how Ukraine was actually ruled by several oligarchs, including some Jewish oligarchs (Vladimir Putin recently slammed these wealthy, influential Jewish families). I spent an hour at this sick, elderly woman's apartment in Kiev listening to her (through a translator) explain how she survives on very little assistance from the government and the JDC. Extreme poverty has plagued the Jewish community of Ukraine, which has been estimated to be around 300,000 members (some argue it is closer to 100,000). There are tens of thousands of at-risk elderly and families with young children who are struggling each day. Today, the JDC works with the local community to help save Ukraine’s poorest Jews by providing for their basic daily needs, revitalizing Jewish life by supporting synagogues, Jewish camps and Jewish community centers, and through developing Jewish leaders among Ukraine's Jewish youth. Ukraine is deeply divided between eastern regions that are largely pro-Russian and western areas that seek closer ties with the European Union. The ongoing political protests were set off by Yanukovych’s shelving of an agreement with the EU in November. Demonstrators have cited political corruption and human rights abuses in their calls for Yanukovych's resignation. If there can be a kernel of optimism in Ukraine's struggles during its independence from the Soviet Union in the past two decades its the success stories of some of the entrepreneurs who have emerged from Ukraine to form flourishing publicly traded companies. At the end of last month the world quickly learned of the rags-to-riches story of Jan Koum. The 38-year-old Jewish founder of WhatsApp grew up in Ukraine in poor conditions. (As an aside, I'm the same age as Koum, meaning that while I was celebrating my bar mitzvah in Michigan in 1989, he was still a Soviet Refusenik in the USSR unable to observe this Jewish rite.) Koum's messaging company was bought by Facebook for $19 billion in a deal announced by Mark Zuckerberg in February. WhatsApp's 450 million customers use the app as an easy way to send messages across borders and between different mobile devices. As the crisis in Ukraine escalated, Koum posted photos of revolutionaries and tweeted "praying for peace and quick resolution to the crisis #ukraine #freedom." Koum grew up in a village near Kiev and immigrated to Mountain View, California as a teen along with thousands of other Soviet Jews as part of the exodus from the former Soviet Union after its collapse. According to Forbes, Koum was "the only child of a housewife and a construction manager who built hospitals and schools. His house [outside of Kiev] had no hot water, and his parents rarely talked on the phone in case it was tapped by the State." With government assistance, Koum and his mother first settled in a small two-bedroom apartment in Mountain View, Calif., when he was 16 (his father, who died in 1997, never made it to the U.S.). To make ends meet, his mother (who brought pens and notebooks from the former Soviet Union so she wouldn't have to buy school supplies in the U.S.) babysat while Jan swept a grocery store. In an interview with Wired's editor David Rowan (video), Jan Koum said his interest in WhatsApp was partially inspired by his memories of how difficult and costly it had been as a new immigrant to stay in touch with relatives back in Ukraine. While Jan Koum's story from Jewish Refusenik growing up outside of Kiev to a billionaire tech icon is inspirational, it's not the first of its kind. Other Silicon Valley success stories that began in the Jewish community of the former Soviet Union include Google's Russian-born Jewish co-founder Sergey Brin and Max Levchin, the Jewish Kiev-born co-founder of Paypal and chairman of Yelp. Sergey Brin's early childhood in communist Russia contributed to Google's famous "Don’t Be Evil" motto. In Mark Malseed's insightful biography of Google's Brin in a 2007 article in Moment Magazine, we see how the anti-Semitism of the Soviet Union played a major role in Brin's upbringing. Sergey's father Michael Brin explained how he was forced to abandon his dream of becoming an astronomer even before he reached college because the Communist Party heads barred Jews from upper professional ranks by denying them entry to universities. "Jews were excluded from the physics department, in particular, at the prestigious Moscow State University, because Soviet leaders did not trust them with nuclear rocket research. Unfortunately for Michael, astronomy fell under the rubric of physics." Malseed writes, "The Brins' story provides me with a clue to the origins of Sergey's entrepreneurial instincts. His parents, academics through and through, deny any role in forming their son's considerable business acumen -- 'He did not learn it from us, absolutely not our area,' Michael says. Yet Sergey's willingness to take risks, his sense of whom to trust and ask for help, his vision to see something better and the conviction to go after it—these traits are evident in much of what Michael Brin did in circumventing the system and working twice as hard as others to earn his doctorate, then leave the Soviet Union." Like Sergey Brin and Jan Koum, the Kiev-born Max Levchin's story of emigration from the former Soviet Union has contributed to his vast success as a tech titan and hugely successful entrepreneur. Life in Kiev for the Levchin family was difficult and they endured virulent anti-Semitism. Levchin's grandfather was a prominent physics professor in Kiev, but was very uncomfortable with Ukraine’s anti-Semitism, so he encouraged the family to emigrate. Since Levchin's mother had an uncle in the Chicago area, his family moved there where he spent his last two years of high school. Living in Chicago in 1991, the 16-year-old Levchin completed high school and went on to study computer science at the University of Illinois, earning his bachelor degree. While studying there he was involved in the establishment of two Internet orientated companies, NetMeridian Software and SponsorNet New Media. Following graduation, Levchin founded his third online enterprise in partnership with another fellow graduate Peter Thiel. The company was originally named Fieldlink, but later changed to Confinity. It was at Confinity, that Levchin, Thiel and Elon Musk developed PayPal. Levchin founded Slide in 2004, which was sold to Google in August 2010 for $182 million. He also helped start Yelp.com and is the largest shareholder today. In 2011, Levchin founded HVF (standing for Hard, Valuable, and Fun) that was intended to explore and fund projects and companies in the area of leveraging data, such as data from analog sensors. The following year Affirm was spun out of HVF, with the goal of building the next generation credit network. In May 2013, HVF helped launched Glow, a company with an eponymous app to help parents conceive babies. Today the Kiev-born Jan Koum has a net worth of $6.8 billion, the Russian-born Sergey Brin is worth about $27.7 billion and the Kiev-born Max Levchin has a net worth of about $300 million. These three young tycoons are not members of any Russian or Ukrainian oligarchs; each man has his own impressive story of growing up as a Jewish Refusenik in the former Soviet Union and, despite that childhood, becoming a tech superstar. While these three Jewish entrepreneurs with roots in the former Soviet Union have become immensely successful and astronomically wealthy, there are thousands of other young businessmen with similar stories who have become very successful, albeit on a smaller level. In the Metro Detroit Jewish community, there are several young entrepreneurs who cite their upbringing behind the wall of Soviet communism as their motivation for business success today. 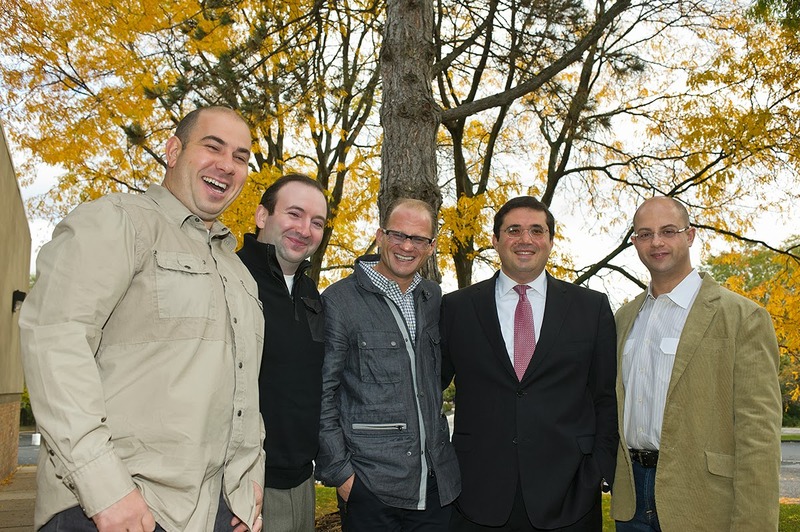 Vladimir Gendelman (far right) with other young former Soviet Jews who have built profitable companies in Metro Detroit. Vladimir Gendelman, 39, of West Bloomfield, a suburb of Detroit, founded Company Folders, Inc., which produces custom made folders and other promotional print items using the latest printing technology. Gendelman was raised in the former Soviet Union. He explains that "growing up in Kharkov, Ukraine my family experienced poor living conditions and seeing the opportunities that America had to offer made me believe that I can make a difference one day." In Ukraine, Gendelman points out that his family wasn't considered "customers" because they were Jewish. Instead, he remembers waiting in long, uncomfortable lines to receive basic goods. "For that reason, I make a point to always provide my clients with the highest standards of customer service and print quality." Gendelman says he's happy the Ukrainian people have risen up against the corrupted government and are seeing the importance of moving toward the European Union rather than Russia. He hopes that one day things will quiet down and Ukraine will move forward in a more Westernized manner. Regarding the rags-to-riches story of Jan Koum, Gendelman remarks, "that is a great story similar to others such as Sergey Brin, but the fact that Koum's parents both died (Koum's mother died in 2000) while he was young and before he achieved success makes it much more dramatic. I can't even imagine how much he would want his mom to know that he is a billionaire now." As the world continues to watch the escalating political uprising and violent protests in Kiev, it's important to understand that there have been some remarkable success stories to emerge from behind the Iron Curtain. Although Ukraine has been free from the grip of Moscow for almost 25 years, it is still struggling to find its true independence from Russia. The wealthy, controlling oligarchs of Ukraine will not be a positive influence for young Ukrainians in the Jewish community, but hopefully these successful entrepreneurs who emerged as wealthy victors in the technology age despite their challenging upbringing as Soviet Refuseniks will provide the inspiration to the next generation of Russian and Ukrainian Jews. No wonder they were "refuseniks" or ברוב יקים in Hebrew. The Soviet leaders probably were aware of the brain power these people were.